K.R. Mangalam World School Paschim Vihar had organized a parents’ orientation of the Pre-schoolers on 25 March 2017, with a goal to ensure a positive atmosphere for learning as well as building up the healthy relationship between the parents, teachers and the dear students. The guest of honor Dr. Bhawna Chadha an eminent psychologist serving as the vice president of corporate Relations and Alliances at pearl Academy graced the occasion through her presence. The programme began with the lighting of the lamp along with the inspirational speech of the Principal, Ms. Meenu Kanwar. She welcomed the chief guest and the dear parents. She told them about the rules and regulations of the school and a Powerpoint presentation was shown to all the parents about the same. Our school counselor Ms. Salonee Lamba who is actively involved in conducting workshops of interactive sessions for teachers parents and students carried on the proceedings . 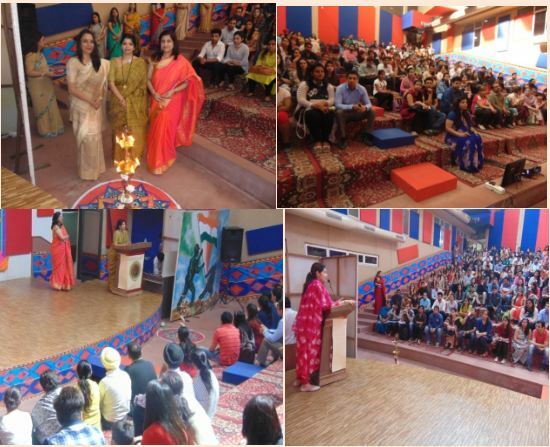 The guest speaker Dr. Bhawna Chadha had an interactive session with the parents. She helped them to understand their child and problems they may face in the new phase of life. A few points were highlighted such as- good parenting, constant communication and significance of observational learning etc. It was indeed a thought provoking and fruitful session. Towards the end, the pre-school class teachers introduced themselves. Parents met their child’s teachers and cleared the queries which brought a comfort level and deeper understanding into the working of the school.